The bedroom is one of the few interior environments where ceramic tile is not commonly found. This is because these spaces are often reserved for softer, more yielding floor products such as carpet, cork, and vinyl. However, there are a number of characteristics that ceramic tiles have which can allow them to be employed successfully and stylishly in a wide variety of bedroom settings. Indoor Air Quality: Ceramics have perfectly smooth, solid surfaces, that dirt, dust, and small particle allergens can not get embedded in. Rather, these substances rest on the surface of the tiles, waiting to be wiped down with a cloth or mop and removed entirely from the environment. This can be an important step to maintaining the quality of the air in the bedroom, especially for people who may have breathing problems. Ease Of Maintenance: Taking care of ceramic floor tile in a bedroom is relatively simple. This material is manufactured to be able to handle rigorous high traffic situations, so the calm serenity of a bedroom shouldn’t pose much of a challenge. Generally, all you will have to do is sweep or vacuum regularly to keep its surface free of dirt. If stains or blemishes do occur then heavy duty cleansers can be used without harming the tile. Durability: Ceramic tiles are built to last for a long time. Solid, strong, and surface impervious, they can withstand all but the toughest of impacts, and don’t easily stain or scratch. 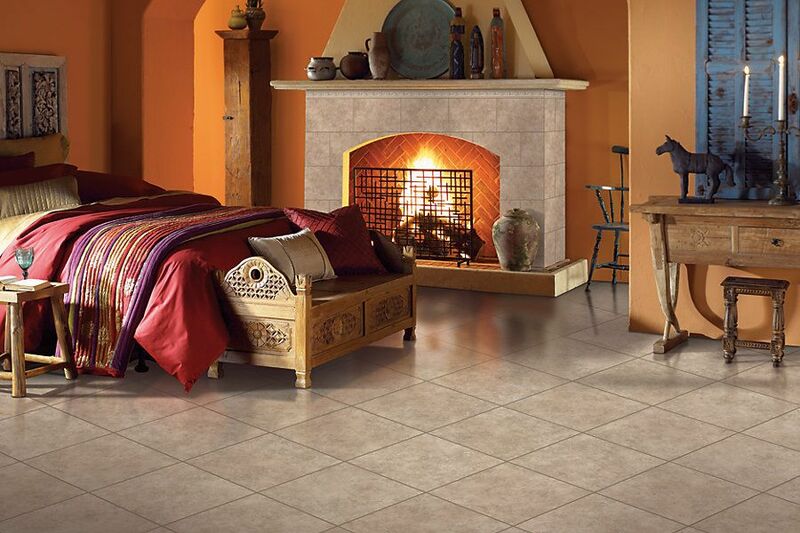 Under normal, well cared for conditions in a low traffic bedroom, a ceramic floor should be able to last for decades. Water: The fact that ceramic tile is impervious to moisture is usually not that important in a bedroom setting. However, many master bedrooms have adjoining bathrooms which can contain showers and tubs. In these situations, a ceramic bedroom floor or even a small ceramic landing area can help to prevent transition spills from one room to the next. Carpeting is a very popular and common bedroom flooring choice. The problem is that carpet is notoriously difficult to deep clean when compared to ceramic tile. Often dirt, liquid spills, and stains can sink down into the fibers of the carpet, spilling deep into the padding and causing set in, hard to reach stains. It can also attract dust and pollen which can later be sent spewing into the air with every footstep taken. Ceramic, by contrast, is easy to clean and maintain, almost never stains and makes it simple to keep the dust on the ground out of the air. A ceramic tile floor will last significantly longer than carpeting, and won’t have any issues with splashes or splatters that may come from adjoining rooms or accidental spills. Temperature: Ceramic tile flooring does not retain heat well, and is naturally cold to the touch. This can be quite jarring on sleepy bare feet setting down from slumber on a chilly winter morning. The way to offset this is to use throw rugs placed strategically throughout the space, near the bed, and near the door. You can also install below-tile radiant heating systems that can actually make your ceramic floor quite toasty. Comfort: Ceramic tile is very hard. This is great for keeping dirt and damage from marring your floor, but it doesn’t make for a very comfortable room. Every time you step on the floor it is going to be a solid stoic surface settled beneath your feet. That feel will carry through to the way you experience the room visually and can lead to a hard atmosphere that you may want to avoid in a peaceful bedroom setting. Design and Value: Ceramic is not a traditional bedroom flooring choice, and in some cases it can ruin the atmosphere of the room, making it seem cold, distant, and unwelcoming. This can, in turn, affect the value of the overall property, which may make it a less desirable investment than more traditional bedroom flooring choices. There are of course exceptions to this rule. Today ceramic tiles can be printed with a variety of designs and colors, and can even replicate the look of natural materials such as stone and wood. As long as you approach the job with an artistic eye, there are a number of stylish ceramic bedroom flooring choices available to you.